Get ready to wow at your next cocktail party. 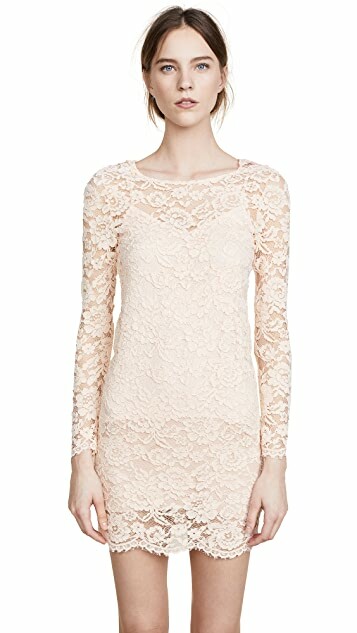 This Loyd/Ford dress is crafted in powder-pink lace for an ultra girly and elegant piece. Loyd/Ford was founded by Stephan Loyd and Franck Ford, both German-born designers who started out with a collaboration on an ’80s clubwear brand. In the mid-’90s, the duo moved to L.A. and began designing costumes for Hollywood films, racking up a range of A-list clientele. After a few years of exploration and discovery in the fashion world, Loyd and Ford launched the Loyd/Ford clothing collection in 2011, offering a modern, romantic take on effortless fashion.